Philadelphia, PA – Wayne R. Carlsen, DO, was awarded the National Board of Osteopathic Medical Examiners’ (NBOME) highest honor, the Santucci Award, on December 8, 2017. The first Santucci Award was presented eight years ago and is named for Thomas F. Santucci, Jr., DO, president and chair of the NBOME Board from 1985 to 1987, a pivotal time of change for the organization. “The Santucci Award is bestowed on an individual for his or her sustained outstanding contributions to the mission of the NBOME, protecting the public by providing the means to assess competencies for osteopathic medicine and related health care professions. 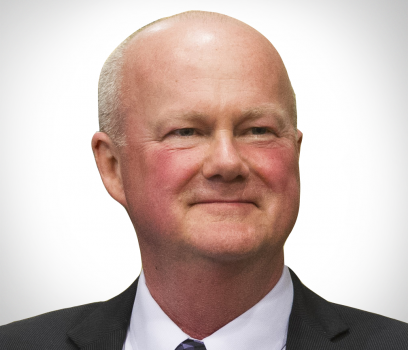 It is with great appreciation that we acknowledge and honor Dr. Carlsen for his contributions to the NBOME, its mission, and indeed the profession at large,” said NBOME Board Chair Gary L. Slick, DO, MA. In 1989, Dr. Carlsen became an Item Writer for the NBOME and has served on a variety of exam construction and item review committees. He was Level 3 Coordinator for COMLEX-USA in the late 1990s and has been a member of the Health Promotion, Disease Prevention/Health Care Delivery Examination Construction Committee. He has served on the NBOME Board since 2005, was installed as 2013-2015 chair in December 2013, and recently served as immediate past chair, chair of the Compensation Subcommittee, and as a member of the Nominating Committee. Dr. Carlsen is vice dean and associate professor in the Department of Family Medicine at the Ohio University Heritage College of Osteopathic Medicine (OU-HCOM), where he has been a faculty member since 1993. In addition to his role at OU-HCOM, Dr. Carlsen has also served as medical director of several skilled nursing facilities in southeast Ohio and has been a practicing geriatrician for more than 20 years. In 2012, he transitioned his clinical practice to part-time to serve the health care needs of uninsured residents through OU-HCOM’s community health programs. He participates in the delivery of geriatric course offerings for OU-HCOM, serves on the college’s Executive Committee, and is the medical director for the college’s Community Health Programs and Area Health Education Center. A 1986 graduate of the University of Medicine and Dentistry of New Jersey School of Osteopathic Medicine, Dr. Carlsen maintains fellowship status in the American College of Osteopathic Internists, the American Geriatrics Society, and the American College of Physicians. He currently practices at O’Bleness Hospital in Athens, OH.